Right outside the Earth School, Tuesday morning October 28, just after 8:30am drop off. I was chatting with another mom and we were startled into silence. Was it two cars that slammed into each other? I peered into the street. Oh my god! 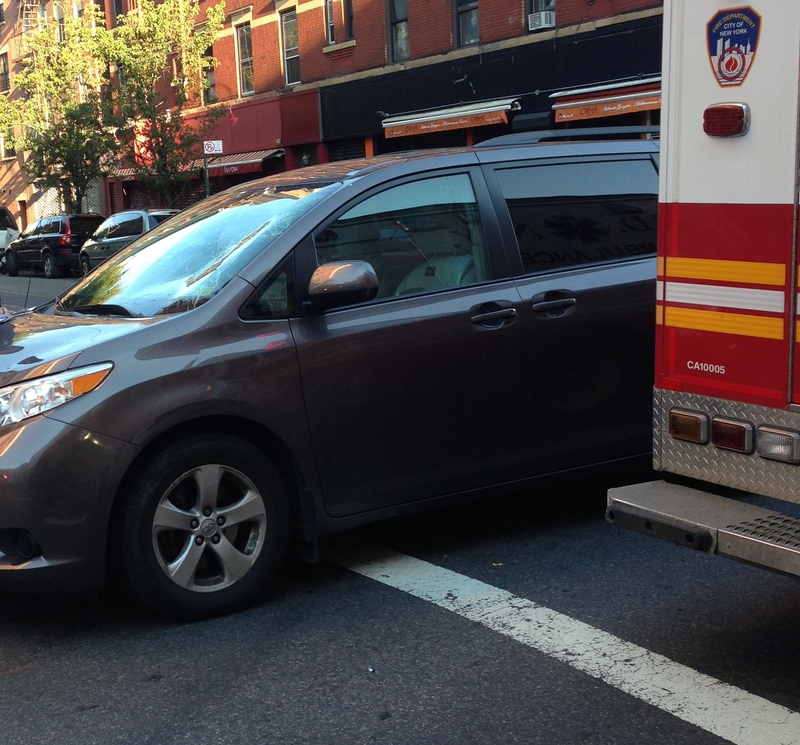 The young woman splayed out on the intersection of Avenue B and 5th Street had been on a bike. I thought to myself “call 911.” Even if others are calling I will still call. I needed to do something. I began to shake. The windshield of the mini van was shattered and dented. Thank God she was wearing a helmet. She was conscious. People gathered around. I spoke to the dispatcher. “It is on Avenue B and 5th street in Manhattan,” I told him. “Is there an address?” I repeated out loud so others could help. Sirens are heard in the distance. The thirty-something Asian couple from the van is stunned. Had he sped up to make the light? One of the dads from school said he saw the women fly through the air. “He was SPEEDING – GOING TOO FAST,” he said in slow motion staccato. He saw the impact where I only heard it. I could see the impact on his face. Why am I crying? The fire department paramedics came. The police came. The ambulance came. I searched online to see if I could find out how she is. None of us outside the school recognized her. This morning, Wednesday October 29 as I walked my son to school I noticed a bit of a commotion outside St. Brigid’s church on Avenue B. Could it be a funeral? I saw no hearse. The boy in the green polo shirt and khaki pants, the uniform of St. Brigid’s School, sat on the church steps holding his socked foot, crying. “What happened?” a passerby asked. I held tight to Finn’s hand. After I dropped Finn to his class I passed Donna. “I am so glad you wear a helmet.” I showed her the image of the smashed minivan windshield I captured with my phone. I heard sirens heading toward St. Brigid’s. I marched to Carol’s class. I walked around all day my body tense, my muscles tightened every time I saw a bare head on a bike. 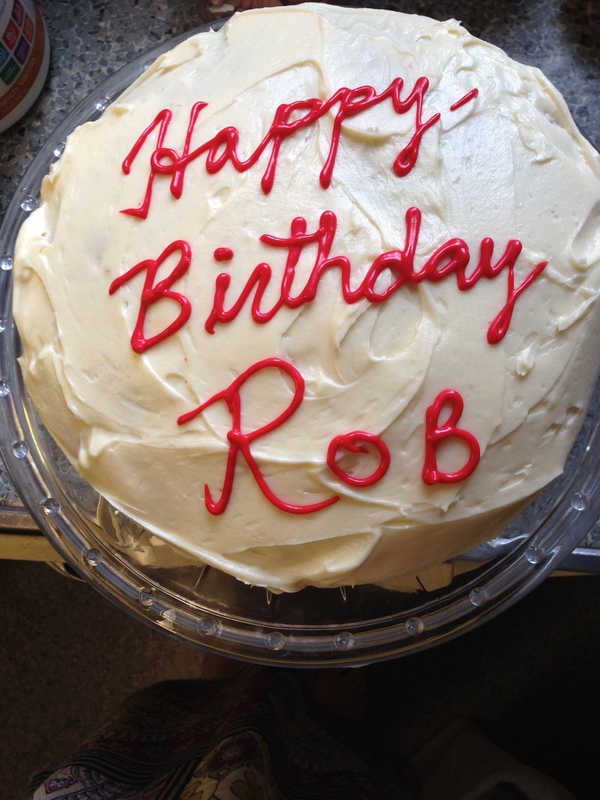 Yesterday I baked Rob a red velvet cake for his birthday – it softened my muscles, it gave me joy. And then seeing the Catholic boy’s foot stiffened me up again. We need to have speed bumps. We need crossing guards at every school intersection. We need to ticket speeding drivers. Sadly, this happens near way too many schools and to way too many bike riders in every city and community in the country. P.S. Pray for your brother on his bike!! he always wears his helmet! !